The recent world is so linked and bent towards online services that even when a guest comes around, “How are you doing?” will be trailed by “What’s your Wi-Fi password?” And as a welcoming host you’ll share the details without even realizing network security risk this sharing may lead to. For instance, visitors might unintentionally copy a malicious program or attach an infected phone, laptop to the network. As some malware are able to spread themselves if an infected device is connected to the network and will try to soil everything in its proximity. Therefore, the best option to secure your network from such situation is to use a Guest Network. A guest wireless network is a way of providing network access to other users with limited permission. The visitor gets their own SSID to connect and the main network still is inaccessible. Guest network enhances network security and you can give Wi-Fi access to friends and family without sharing Wi-Fi password. Why to Set Up Guest Wi-Fi Network? Denying something to a guest is not welcoming but putting network connection at risk is also not a great idea. Therefore, to make both things possible hospitality and safety a guest Wi-fi should be set up. A guest Wi-Fi network is a discrete access point setup on your router, where all your internal devices are connected to a single point, guest network will be an altogether different point. Using guest network is a win-win situation: you can keep your data safe even after giving them wi-fi access. Malware will not be able to infect your network. How to Set Up Guest Network? Setting up a guest network is not at all difficult it is as easy as it sounds. Even more there is no need to pay twice to your ISP. By going to your Wi-fi router settings you can set up a supplementary guest network. For setting up you need head to routers settings and activate it. Enter your router’s IP address in the address bar (most commonly it is 192.168.0.1 or 192.168.1.1). However, if this does not work for your, refer to router’s manual. Once you do so, you will see a dialog box where you need to enter administrator username and password. If you have not changed them ever then you can find them in the manual or can ask your ISP for the same. However, for improved security it is advisable to change them and keep the details secure so that you can use them when required. No in the router settings look for Allow guest access or Guest network. Usually, it is hidden under Wi-Fi section. If you are unable to locate it, you can check the manual or can take help from Google. But for that you need to know model number of your router. Note: If you are using a low-end model or an old router you may not see the option to setup a guest network. But if you have the recent model and still unable to find then you should contact support as most modern routers have the option. Now that you have selected the relevant check box, add name of the guest network (SSID), this will be name of your friend whom who are giving the access to. They will be able to see it in the list of available connections. 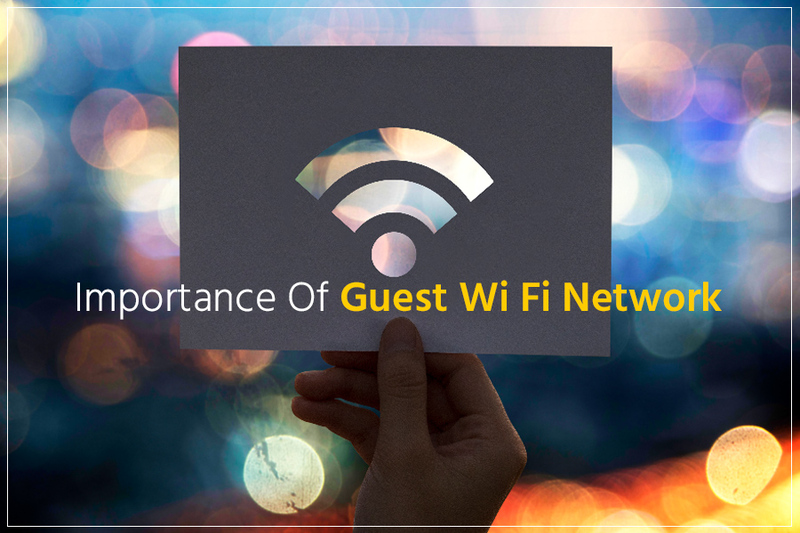 Guest Wi-fi access gets automatically activated however if you are facing any problem then some tweaking might be required. We recommend you check the configuration settings even if you get connected automatically. Set a strong password for your new account. The option for the same is available under the network name. Once you do so, users who will have the password will be able to use the guest connection. For security purposes we suggest you to setup encryption type. This will not let anyone intercept the information shared over Wi-Fi. You can choose WPA2 (WPA2-PSK or WPA2-Personal) as the encryption type. In mostly all modern devices you will be able to find these two options. Now, that the password and encryption method is done. You need to ensure that no option that may reveal your personal information to the guest is enabled. First you need to check whether “Allow guests to access local network resources (or similar)” is enabled or disabled. If checked uncheck it because if this option remains checked then the whole point of setting up a guest network becomes useless. Note: Some routers may as ask you to check the option to dis-allow the guest. Therefore, we recommend you read the option carefully and then check or uncheck it. Next, if an option like: Allow access to settings (or similar), exists disable it. Why because this option will allow guest network to access router settings and reconfigure it including guest permissions. Now that you have followed all the steps, all is set. You have successfully configured guest Wi-Fi network that will provide both internet access and will protect your devices from malware. Improved Security: Guest Wi-Fi not only pleases crowd, but it is also a terrific way of providing additional security to your network. Guest network allows to create multi-tier login (Role Based Access Control) to provide separate lines for internal and guest traffic with different permissions for different devices. It is the best way to manage and monitor network activities and see who is accessing your network and how. Collect user data: Another benefit of guest network is to keep a check on traffic and collect user data to get a clear picture of how long user stays in your space and what they do while they are connected. Faster Wi-Fi: Guest network helps to close the gap between latest and old models that we connect like IoT. Guest Wi-Fi offers added security and allows to manage all new network that come in you network range. Using these simple steps, you can easily setup a guest wi-fi and keep your data secure. With guest Wi-Fi enabled you no longer need to worry about sharing your internet connection with friends and family. It is the smartest way of granting Internet access and keeping your data secure. We hope you liked the article, if you like it please leave a feedback and do let us know if you want us to write on any particular topic. ← Why Is It Important To Optimize Your Machine?